I have not bought one for a while. You would think they would remove it from the catalogue. Mine was the 94 530, and the EAT chip was the problem. After changing it out I went another 110K miles before I sold it with no trans issues. Started clean with a completely overhauled transmission. When using a valve body in which I only worked on the main channel plate (cleaning + replacement of balls and orifices) the transmission shifts like new except for the 1->2 shift. When using a valve body in which I worked on the main channel plate AND where I have also replaced ALL springs with OEM ZF new ones, the transmission shifts like new except my 2->1 downshift gives me a slight jerk as described in this topic. Valve body 2 and 3 are definately the better valve bodies for all other shift points when compared to valve body 1. - The car upshifts to 2 gear but never goes higher than 2. So 1->2 and then 2->1. This 2->1 thing is the final piece of the puzzle! Last edited by Frank87; 10-17-2015 at 03:59 PM. Did you try disconnecting the brake light switch yet? Could be some issue with the check control unit that enables engine braking while slowing down however it shouldn't have anything to do with the 1-2 upshift. It must be valve body related. Old sloppy valve body gives me a good 2-1 downshift. Completely overhauled valve body gives me a bad 2-1 downshift. Which leads me to question other partially related items. Which paper gasket did you use between the valve body plates and which one was originally installed? Did you check the new one by cross checking it with the old one coming out of the valve body? identical holes and channels? Usually I lay one over the other to compare. I bought both of them as I do that more often on other cars and according to this expert, the new gasket can replace an old gasket (originally installed) but a old gasket version cannot be installed in a valve body originally equipped with a new version. Last edited by shogun; 10-18-2015 at 09:25 PM. I used the newer gasket. I ordered 5 of both part numbers "just in case" as they dont cost anything. The older gasket has 1 big hole where the filterneck connects with the valve body. The newer gasket has 1 big hole where the filterneck connects with the valve body and a small rectangle shaped hole right next to it. I have used that newer style gasket with 2 big holes more often in the past without issues. Option 3 was a cheap and easy option as he had access to all kinds of vendors we individuals don't. He came up with the exact same used valve body from a 088 transmission, measured it, slotted in the improved selector piston and sold it to me as the solution. I fit this valve body and after a thorough reset of the entire car (DME, AGS etc. ), the transmission started shifting better and better. The box is now excellent and the 2-1 jerk was explained by bore wear in valve housings. Since I fit a used valve body, it will last perhaps up to 150.000km instead of 300.000. I already put about 20.000km on the box so in 30.000 km, after a good 50.000, I will probably do an oil change and may even fit a factory new valve body to see if that makes the box shift even better. This would cost me about 1000 euros. 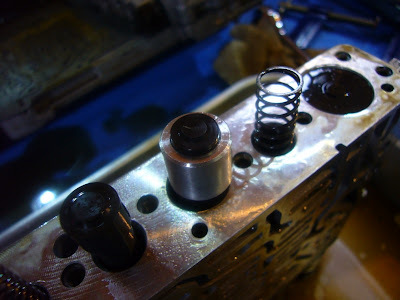 The fine shifting valve body I have now, will be held in reserve. I am going to overhaul the 5HP18 box that came out of the car after my previous overhaul as I plan on buying a 3.0 V8 sedan or touring for my girlfriend in about a year or so. That car can then be fitted with this overhauled box with the used but "ok" valve body. This makes it possible to specifically look for a car with autobox damage meaning the price goes down. Excellent info, Frank. Thanks a lot. I might add, we always test the solenoids + pistons inside the bore with ATF when the valve body is disassembled, if it moves softly. 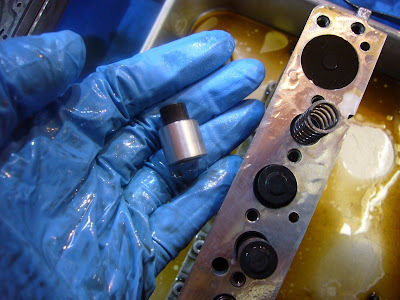 We also polish the solenoids in such case as well as the bore. Usually helps to overcome the problem. Otherwise you have to get hold of another used valve body and use the parts needed for swopping. That is an old youtube from 7 years ago when we were still learning.